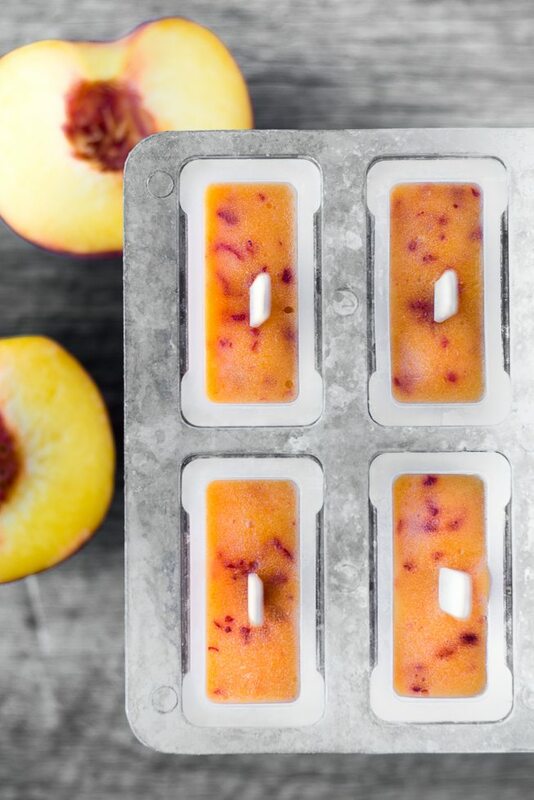 Ripe Peach Popsicles — the next best thing to sinking your teeth into a fresh picked peach…let the juice dribble down your chin! This is part of a continuing mini series all about transforming fresh summer fruit into frosty popsicles. They contain no other ingredients but the ripe fruit, a touch of sugar, and a squeeze of lemon. My CHERRY POPSICLES were transcendent. So were my WHOLE FRUIT POPS. These are no less. I’ve got at least one more installment coming up before I’ll let go of the bone — it’s just too much fun and they are so insanely tasty. Don’t you dare peel those peaches, the skin is where the vitamins, flavor, and bright bits of color come from. Chop them up, pile them in the food processor or blender, and puree. It’s kind of an obvious concept, I know, but honestly you can’t find this kind of thing at your local supermarket. You’ve got to make it yourself. Depending on my fruit I’ll add a touch of sugar and some lemon juice, but that’s it. If you’re serving adults, you can add some liqueur. There’s nothing better on a hot night. TIP:Ok, if you insist on peeling your peaches, do it the easy way, use a serrated peeler — it’ll make quick work of the job. 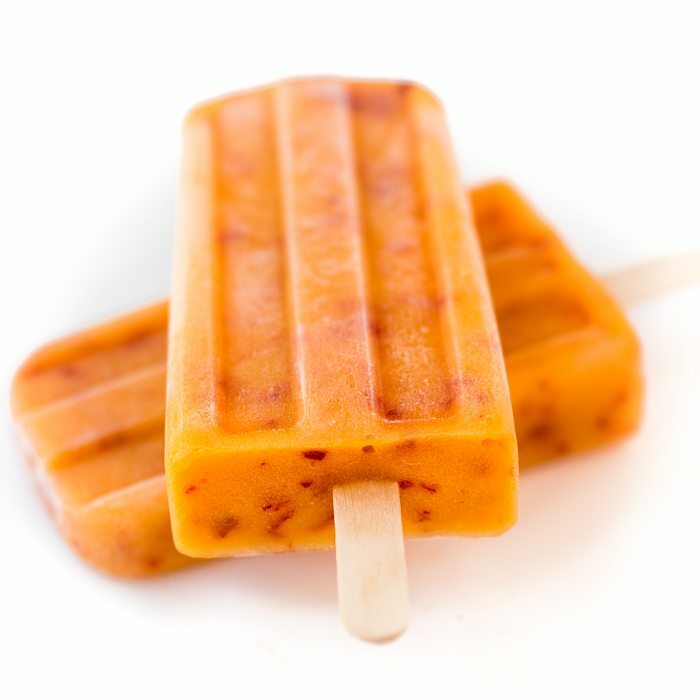 Mass produced fruit popsicles are mostly water and sugar, but these are made from pureed fruit and so they have nice texture to them as well as lots of nutritional value. And don’t get me started on the flavor…they really do taste just like biting into a piece of fresh fruit. There’s still plenty of time to get a popsicle maker and have your own fun…here in California popsicle weather continues right up until Halloween…the one I use is pictured at the end of the post. As a general rule of thumb, a good sized peach will make 2 popsicles. This is a delicious way to use up ripe (or slightly over-ripe) fruit that won’t get eaten in time. 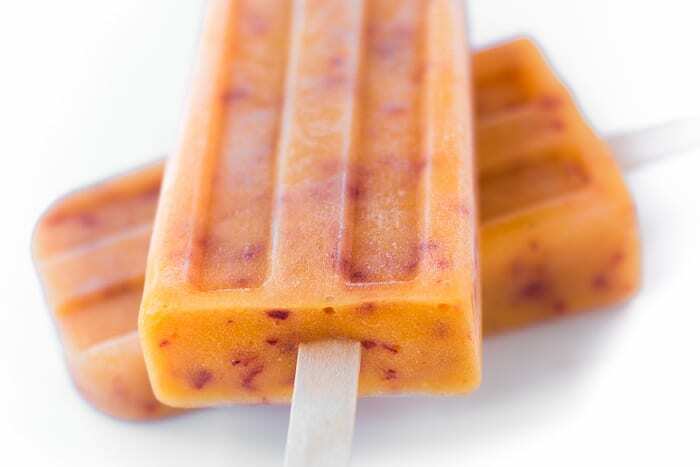 There’s nothing to stop you from mixing fruit, you can blend peaches, nectarines, apricots, etc, for your own custom pops. I think it would be incredible to do this with white peaches. Slice the peaches in half, remove the pits, and give them a rough chop. 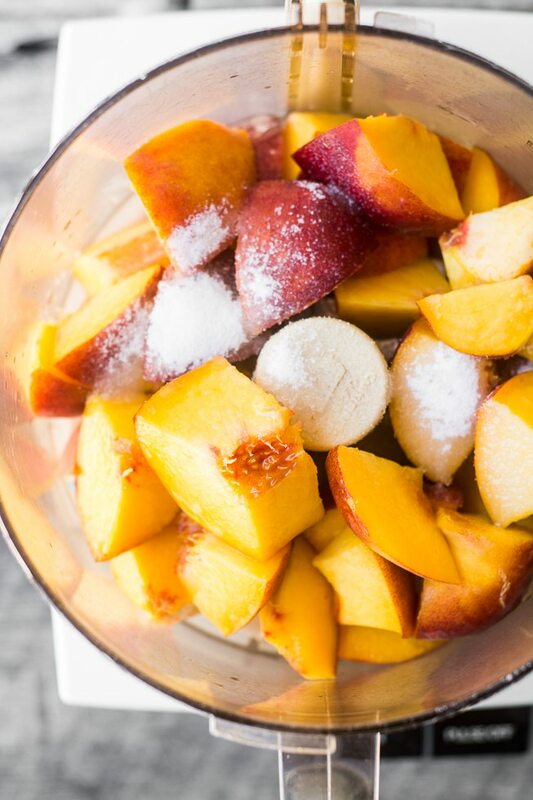 Add the peaches to a food processor or blender, along with the sugar and lemon juice. Puree until smooth. Fill the popsicle molds to the top, and then insert sticks. Freeze until solid. To remove the popsicles, fill a sink with hot water and immerse the mold up to, but not over, the top lip for several seconds, then remove the popsicles. To store, wrap securely in plastic and put back in the freezer. 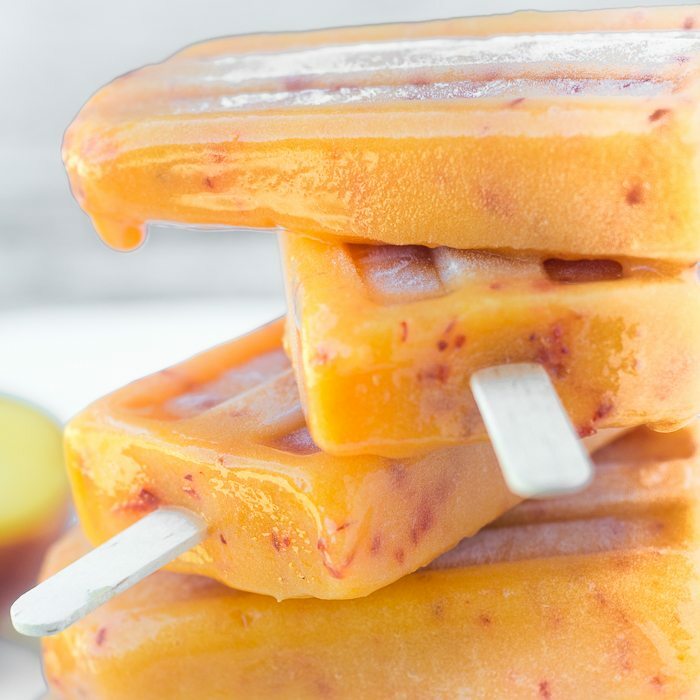 Don’t forget to pin these Ripe Peach Popsicles! I had a couple peaches getting to soft and I came across your post. I didnt have any lemon so I used lime juice. It tasted delicious after I blended it up. I’m excited to try it frozen. Thanks! I had oral surgery a few days ago and haven’t been able to eat fruit, which I dearly love! 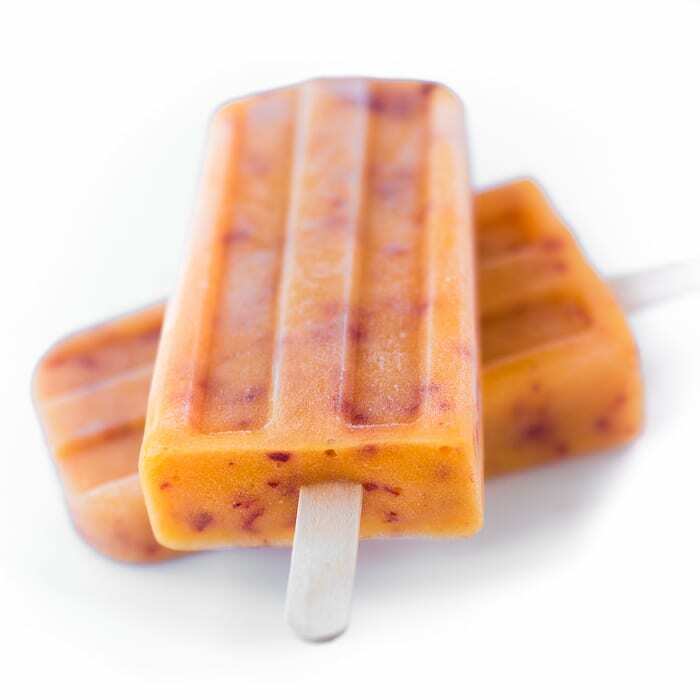 I had three organic nectarines in the fridge (they were ripe) and I didn’t want to lose them, so I made these pops. Not only do I get a healthy, yummy treat (which feels oh so good on my mouth) but I didn’t waste the lovely nectarines. 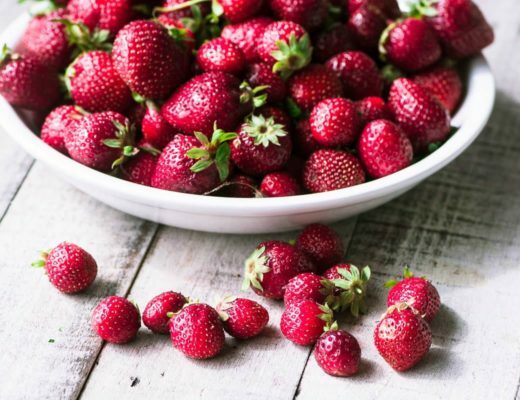 Gonna make some with berries tomorrow. Thank you for this easy, healthy recipe. I used white peaches and plums together, it is in the freezer now. I use a spoon to put it in the molds, is their an easier way?? Tastes real yummy. Love your recipes. I usually pour the puree into the mold from a glass measuring cup with a spout, but sometimes I’ll put the pureed fruit in a baggie and cut off the corner to squeeze it in neatly. But even if you use a spoon you can always wipe off any drips from the top of the mold before freezing. Hope you love them, I like the idea of mixing in plums. I just made a white peach version which I might put up on the blog, they’re pretty in pink! Thank you for responding so quickly. They came out more purple because of the plums. By leaving the lid off, it is much easier to remove from the mold. The taste is so yummy, all fruit no ice taste. Thank you again. I know what you mean about the all fruit/no ice, it’s very unusual, and really does taste just like fresh fruit. I puree homegrown peaches from a friend in the blender. The peach puree have a burnt-orange hue from the skins, not speckled like yours. Doesn’t look like peach ice pops anymore, But tastes fantastic. What should i have done differently? You might peel your peaches next time, or peel some of them. I’m guessing that different varieties of peaches have differing skins, and that made a difference in your pops. You are right. This variety had very red orange skins. It looks unappealing, but tastes really good. I will leave out some of the skins next time. Thank you! Do you think using a food processor may be better? I used a vitanix. The vitamix is a real game changer, and yes, that might have been why your popsicles were so dark, the vitamix really pulverizes everything. Great for some things, not so much for others. Try a food processor next time. Love peaches! This is perfect! Oh I need to make these Sue. What a splendid idea and way to use over ripe fruit. Love this idea. Thanks. Such pretty pops, I need to make a stash for my freezer asap! Can’t wait for peach season – it will be here soon! You need to do an ebook with all your popsicles, Sue! Beautiful, healthy and so creative! We should be getting peaches anytime now, love, love these Sue, you are the master. These sounds like a frozen peach pie… If I wish to make a batch with a bit of Bourbon or PeachTree Scnapps, how much is the right amount? 1/4 C or more? I think the formula is no more than 20% alcohol or it won’t freeze, so with popsicles unfortunately you’re limited as to how ‘boozy’ you can make them. The puree for these pops comes to a little over 2 cups, so I think you could try a little more than 1/4 cup and get away with it! Sue, I just made peach ice cream. NOW I’m going to make these peach popsicles! I wouldn’t peel the peaches for this either; besides the nutrition, it wouldn’t look as pretty! I never peel peaches for pie either. Another way for my husband to enjoy peaches, though he doesn’t like to just eat a peach. Is that only for organic or even for the regular ones too? I was a bit concerned because of peaches topping the dirty dozen list.. thanks! What a wonderful way to enjoy the juicy, delicious flavor of a ripe peach! 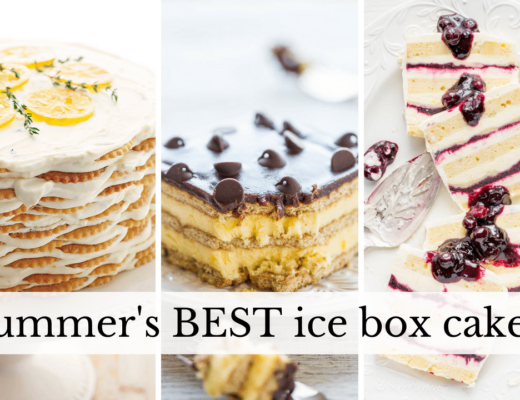 You really know how to make the best popsicles ~ great for kids too – a terrific summer treat – so pretty too! I love the idea of capturing that fabulous fresh peach flavor for any time of the day or night. And your popsicles make a sweet, delicious treat so legal! OK, totally drooling! :) What a great, healthy way to beat the heat! And, the color is gorgeous! I’ve never made anything like this before but looking at your pictures and the recipe I am inspired to give them a go. So glad you advise not to peel the peaches. 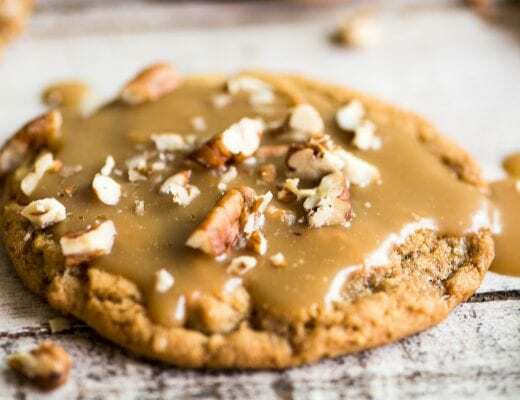 These look so good I now can’t wait to make them. Thanks Sarah, I sometimes feel self conscious when go off on one of these ‘kicks’, but in this case I think the idea bears repeating, and each popsicle has such a different personality. I have a ton of peaches that are “on the edge” in my kitchen right now — now I know what to do with them! Thank you! So perfect for hot summer days!